Fig. 6 Agricultural policy. 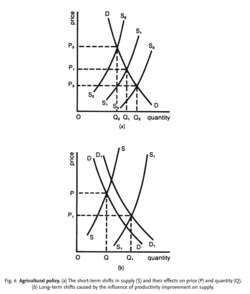 (a) The short-term shifts in supply (S) and their effects on price (P) and quantity (Q). (b) Long-term shifts caused by the influence of productivity improvement on supply. a policy concerned both with protecting the economic interests of the agricultural community by subsidizing farm prices and incomes, and with promoting greater efficiency by encouraging farm consolidation and mechanization. The rationale for supporting agriculture partly reflects the ‘special case’ nature of the industry itself: agriculture, unlike manufacturing industry, is especially vulnerable to events outside its immediate control. Supply tends to fluctuate erratically from year to year, depending upon such vagaries as the weather and the incidence of pestilence and disease, S1, S2 and S3 in Fig. 6 (a), causing wide changes in farm prices and farm incomes. Over the long term, while the demand for many basic foodstuffs and animal produce has grown only slowly, from DD to D1D1 in Fig. 6 (b), significant PRODUCTIVITY improvements associated with farm mechanization, chemical fertilizers and pesticides, etc., have tended to increase supply at a faster rate than demand, from SS to S1 S1 in Fig. 6 (b), causing farm prices and incomes to fall (see MARKET FAILURE). Farming can thus be very much a hit-and-miss affair, and governments concerned with the impact of changes in food supplies and prices (on, for example, the level of farm incomes, the balance of payments and inflation rates) may well feel some imperative to regulate the situation. But there are also social and political factors at work; for example, the desire to preserve rural communities and the fact that, even in some advanced industrial countries (for example, the European Union), the agricultural sector often commands a political vote out of all proportion to its economic weight. See ENGEL'S LAW, COBWEB THEOREM, PRICE SUPPORT, INCOME SUPPORT, COMMON AGRICULTURAL POLICY, FOOD AND AGRICULTURAL ORGANIZATION. My Department s consultation on the Policy Options arising from the Reform of the Common Agricultural Policy (Pillar I Direct Payments) has now closed and I am greatly encouraged by the very significant number of responses received, more than 850, from a wide range of individuals and organisations. Mrs Fischer Boel said the reform of the Common Agricultural Policy in 2003 had "paved the way for young farmers to be entrepreneurs" much more than under the old CAP, particularly through the decoupled payments which are intended to make farmers more responsive to market conditions instead of producing more in order to get more subsidies. The Congress also gives world leaders the opportunity to share achievements and success stories in agricultural policy that bridge gaps, translating those successes into practical solutions for a more peaceful and equitable global society. MR Adamu Musa, the National Organising Secretary, National Tomato Growers, Processors and Marketers Association of Nigeria said the Federal Government's agricultural policy had enriched more farmers in the last two years. The Minister of Agriculture and Fisheries, Food and Environment, Isabel Garca Tejerina, will travel on 23 and 24 January, on an official trip to Warsaw (Poland), where she will meet with her counterpart, the Minister of Agriculture and Rural Development Krzysztof Jurgiel, to address the position of both countries in relation to the Common Agricultural Policy (CAP), whose future will be raised in 2018. The Woodland Trust (Coed Cadw) wants the Welsh Government to recast the Common Agricultural Policy (CAP) as a Sustainable Land Use Policy. Summary: New Delhi [India], Jan 16 (ANI): Joint Secretary in the Ministry of Commerce Santosh Kumar Sarangi on Tuesday said that the drafting of a new agricultural policy would promote export of sectoral commodities. THE NFU has set out a threephase approach for the reform of the Common Agricultural Policy (CAP) when Britain leaves the EU. Apost-Brexit agricultural policy for Wales should provide basic income support for farmers and protection against market volatility, NFU Cymru has said. I was very happy to sign the NFU's post-referendum pledge to Back British Farming and I will do all I can to ensure that we build a domestic agricultural policy which is adapted to our needs, easy to understand and simple to administer. The agricultural policy supposes measures meant to improve the agricultural real estates, to increase competitiveness and productivity in the agricultural sector, to sustain producers, as well as measures of intensive development of agriculture, by endowing it with technological equipment and by using the newest and most effective methods of production, measures for the adoption of the common agricultural policy, measures for the observance of the sanitary-veterinary criteria (Dess, 2010), measures for the development of the rural area and of the activities related to agriculture, etc. After the formal adoption of a set of delegated acts for the reform of the Common Agricultural Policy (CAP), on 11 March, the European Commission has made the documents public.